187 labyrinths found. Showing 41-60. Sorted by country, state, city, then zip/postal code. 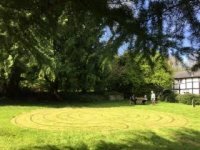 The labyrinth is in the grounds of St Martin's Priory, a university building. Daylight hours during university terms. Other times possible by arrangement. Access is possible during university opening hours. Please contact Sonia with any queries. The labyrinth is in the university grounds, on the grassy slopes overlooking the city and cathedral. It is below Eliot College and next to the footpath/cycle path leading from Eliot College to the city. Footpath (wheelchair accessible) starts at Eliot College car park (parking for wheelchair users; cycle rack). Other parking: see signs on campus. Once parked elsewhere, follow signs to Eliot College, enter car park (to right of College), look for the mini-roundabout and follow footpath as below. Buses from city to University, ask for Keynes College. From this bus stop it is a short walk. Continue up hill, turn right at pedestrian zone. Keep right, past Eliot car park and look for the mini-roundabout. From here go straight ahead, on the footpath leading between buildings onto the grassy slopes. The Labyrinth is a short distance ahead on your left. Usually open, but there will be times when access will be restricted for specific events. If you are travelling some distance to visit, please check availability. The labyrinth is on the University campus. Everyone is welcome to visit. We ask visitors to respect this quiet, reflective space. A seven-circuit medieval-type labyrinth with topographical symmetry and an additional circular path enclosing the space. The labyrinth and its surroundings have been designed to enable wheelchair access. Wheelchair Access: accessible to users of hand-propelled wheelchairs. A hand-held labyrinth is always available as an alternative for users of motorised wheelchairs. Mainly for university use, for one-off events, but enquiries welcome. Handpainted Chartres replica, Veriditas variant. The hospice is located on the outskirts of Canterbury in London Road, just off the A2. 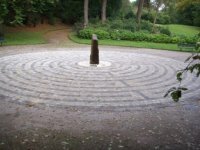 Once in the hospice grounds, the labyrinth is situated towards the rear of the car park, past the Victorian building. There is a path leading to the Labyrinth garden with an explanation sign and shelter. There will be times when access will be restricted when the labyrinth is booked for specific groups. Please check availability and groups are asked to book. Parking is outside the hospice grounds. The labyrinth forms the central part of the Therapeutic Labyrinth Garden that has been built primarily for hospice patients and carers but everyone is welcome. We invite visitors to respect the peace of the garden. 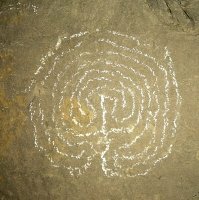 Five chalked labyrinths were discovered deep underground in 1979 in the ancient Merstham/Chaldon firestone mines, Surrey, UK. They are in what is known as the no.9 series, and likely date from the first half of the 18th century, together with other dated graffiti in the same vicinity. It is believed that they were drawn by visitors rather than miners. For more information see the "Chaldon Labyrinths" article on the website below. These labyrinths are located underground in an abandoned stone quarry and require the services of skilled cavers to guide visitors to the location. Under no circumstances consider trying to enter the mine system without expert guidance and the correct safety proceedures. Early 18th century - probably 1720's? 10 miles SE of Oxford, not far from M40 motorway. 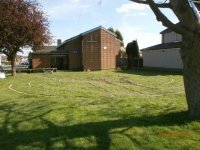 The labyrinth was cut into the grass of the churchyard extension in May 2009. The outline shows in simple form, the shape of a scallop shell. The choice of shape is deliberate. The scallop has been symbolic of Christian pilgrimage since medieval times - a period in history when the interior walls of St. Mary's Church were being decorated with beautiful paintings depicting the stories of Jesus, and Mary his mother. Portable canvas labyrinth used for events on campus and beyond: part of the University's Creative Campus Initiative. Owned by Unit for the Enhancement for Learning and Teaching, University of Kent. Contact details as above. Enquiries welcome. A canvas version of the Canterbury Labyrinth (see Locator). 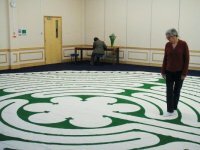 Includes unusual 'circle path' surrounding the seven-circuit labyrinth. 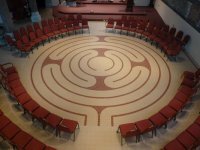 Chislehurst Methodist Church is the only Methodist church in the UK with a permanent indoor labyrinth. By road: Chislehurst is inside the M25 (exit junction 3 Swanley). By train: only half an hour from London Charing Cross, the Methodist Church is fairly close to Chislehurst Station. Based on a water feature in Qasr al-Azm Palace in Damascus, Syria. In the hospice grounds, this is a 3 circuit labyrinth that is wheel chair friendly. 3 circuit due to space and needing to be wheel chair friendly. It was first established in 2018. We intend to keep it mown, so it should always be there - but it may be less visible in winter. Turn left from Colliers Wood Underground station (Northern Line) The labyrinth is mown into the grass in front of Christ Church, about 150 yards away.